Product prices and availability are accurate as of 2019-02-28 17:27:27 UTC and are subject to change. Any price and availability information displayed on http://www.amazon.com/ at the time of purchase will apply to the purchase of this product. Doomlands 2169 is a brand-new post-apocalyptic line from Nerf. 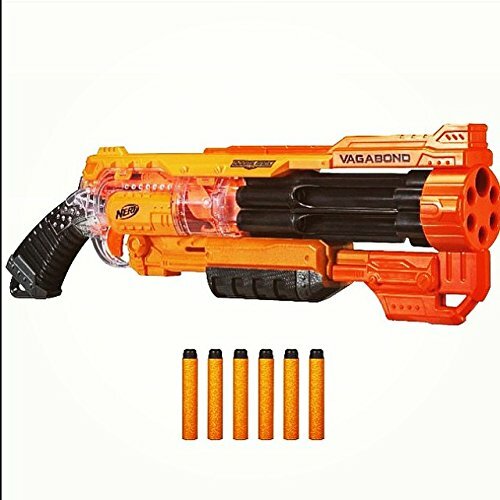 The Vagabond is one of the very first blasters launched in this line. The blaster has a really cool design that includes a pump action prime and viewable internals. Also has a long 6 dark rotating barrel. 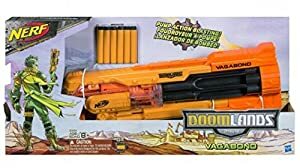 Nerf Doomlands Vagabond comes with 6 yellow and black elite darts. The blaster has a six dart rotating barrel. Blaster has shotgun/Pump action prime. Nerf blaster has see-through plastic so you can view it functioning. The blaster can fire six darts before reloading.